Recently whilst browsing Twitter I discovered the perfect club for me……’The Clandestine Cake Club’, http://clandestinecakeclub.co.uk/ The club, first established in Leeds and rapidly expanding across the country offers the opportunity for people to get together over coffee and cake……what’s not to like! Members bake their own cake at home and bring it along to a planned secret location. I’ve completely fallen in love with the idea of a cake club and the fact it is secret makes it even more fabulous! Social interaction with fellow cake lovers whilst sampling the creative talents of the clubs members is just too good an opportunity to miss, so I set about becoming a member and tomorrow will attend my first ever Cake Club in Manchester. There is no charge for tomorrows meet up, I just have to rock up with my cake and get stuck in, I’ve even been reminded to bring along some tupperware to take surplus cake home! I will receive a text message some time tomorrow giving me details of the as yet secret venue, I am so excited by the whole secrecy of it, so quirky and fun. Looking through the pictures of cakes made for previous gatherings I wanted to find something special to make. 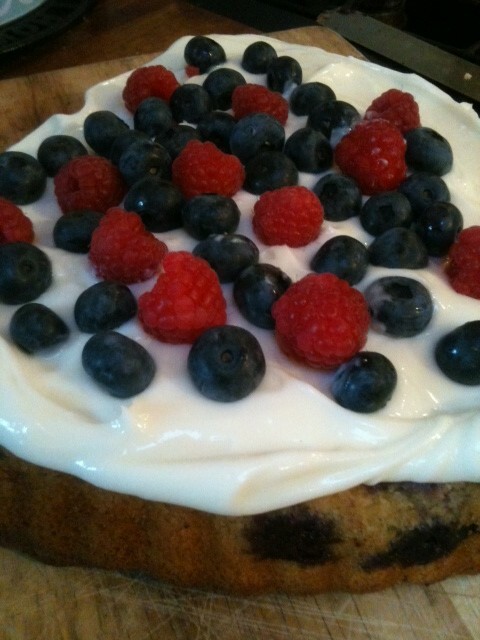 The theme for the meet up is ‘Summer Holidays’ I decided I wanted to include some summer fruits in my cake so after a little investigating on google I found a great recipe for a Blueberry Soured Cream Cake with Cheesecake Frosting, yum! I decided to tweak it slightly by adding raspberries too. 1. Preheat the oven to fan160C/ conventional 180C/gas 4 and butter and line the base of a loose-based 22cm round cake tin with non-stick baking paper. 2. Put the butter, sugar, eggs,flour, baking powder and vanilla in a bowl. Beat with a wooden spoon for 2-3 minutes, or with a hand electric beater for 1-2 minutes, until lighter in colour and well mixed. Beat in 4 tbsp soured cream, the mixture should be of a lovely silky texture once the soured cream has been beaten in. Then stir in half the blueberries and raspberries with a large spoon. 3. 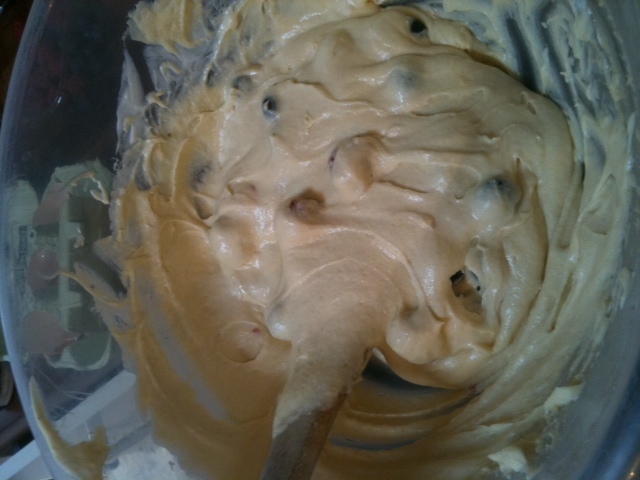 Tip the mixture into the tin and spread it level. Bake for 50 minutes until it is risen, feels firm to the touch and springs back when lightly pressed. Cool for 10 minutes, then take out of the tin and peel off the paper or lining. Leave to finish cooling on a wire rack. 4. To make the frosting, beat the soft cheese with the icing sugar and the remaining soured cream in a bowl until smooth and creamy. Spread over the top of the cooled cake (don’t be impatient as the frosting will melt if the cake is too warm) and scatter with the remaining blueberries and raspberries. The cake will keep in the fridge for a couple of days. Bring it to room temperature for about an hour before serving. And now the cake is residing in my fridge where it will stay until we travel to Manchester tomorrow to meet more fellow cake lovers, it is torture knowing it’s there but can’t be touched, roll on 7pm tomorrow…..location of course tba! Self confessed tea and cake addict, wine buff (if whatever is on offer at Tesco qualifies me) theatre reviewer and of course photography lover! 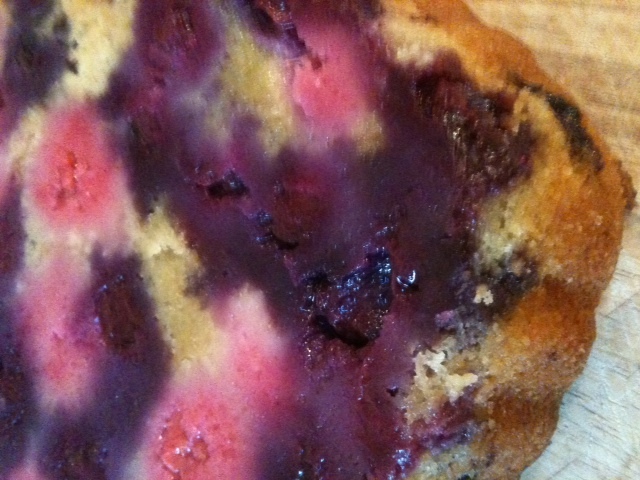 This entry was posted in Baking and tagged baking, blueberry, cake, cheesecake, coffee, Manchester, raspberry, social gatherings, summer holidays. Bookmark the permalink. 8 Responses to Cake glorious cake! I’m so pleased you like my concept for Clandestine Cake Club. I’m sure you’ll have fun tomorrow. Your cake looks great. It was as good as it sounds! Lovely to meet you, and your cake. Was I very rude? I think I greeted everyone as they arrived by saying hello are you Lemon Drizzle Cake? rather than their names!